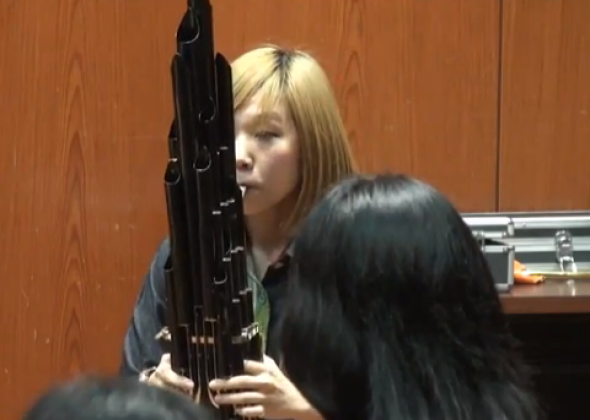 Sheng, an ancient Chinese instrument, sounds like 8-bit Mario. Look what Tastefully Offensive found that Gizmodo found that we found: a girl playing the Super Mario Bros. theme on a sheng, “a Chinese instrument invented thousands of years ago.” What’s so neat about this video isn’t just that it’s a real instrument playing video game music—there are plenty of human performances of Koji Kondo’s classic composition on YouTube—but how well the instrument mimics the chiptune audio of the Nintendo Entertainment System, down to the sound effects. Listen: That’s Mario growing big with a Super Mushroom. Now he’s collecting a string of coins! The sheng looks kind of like a mini-organ you play with your mouth—something less suited for video game music than for today’s modern, on-the-go Phantom of the Opera to play Bach’s Toccata and Fugue in D minor—but the sound it produces, halfway between a harmonica and steel drums, perfectly evokes the electro-tropicality of the Mushroom Kingdom. Pretty and all, but it sounds more like the violin setting on my old Casio keyboard than the accompaniment Mario is accustomed to. What gives? Well, the sheng is technically an “ancient” instrument, as Tastefully Offensive and Gizmodo call it. This woodwind was invented around 1,000 B.C., and from the looks of it probably sounded more like panpipes than a harmonica. But since then, it’s gone through a whooole lot of changes. Pipes proliferated, bamboo was switched out for steel, reeds were added, and the keys the girl is pressing down were developed as recently as the ‘50s. As this rendition of music from My Neighbor Totoro shows, shengs now come in all shapes, sizes, ranges, and tones. So while the Mario-music video is neat, don’t get too caught up in the magic. This particular sheng could very well have been engineered specifically to sound like an old Nintendo. It’s not like it was unearthed by archaeologists and when they played it, the mystical thread that binds all things Asian was revealed at last. The oddity here isn’t how much an ancient instrument sounds like modern technology, but how much a modern instrument echoes ancient video game technology.